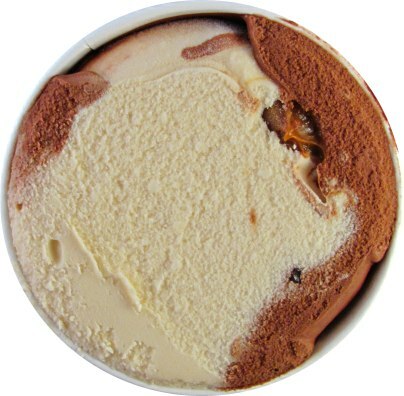 [By Nick] Oh hey there, Karamel Sutra Core. How have you been? Is that a new pint design you're sporting? It does look good on you. I know I've passed you up countless times in the past for more exciting flavors. I'm very sorry and I'm here to change all of that. You see, with the impending arrival of your 4 new core team members "that's my jam", "salted caramel" (Nick's review here), "peanut butter fudge" (Dubba's review here), and "hazed & confused" (Dubba's review here), I thought it would be best to get to know the original core flavor. Sure you were a part of another core team in 2002 but you were the lone survivor and that has to mean something. I think the reason I've passed on you so many times is your composition. Let's just say it isn't all that appealing to me. Both of the bases have been subpar in other flavors and those fudge chips do get old after trying the majority of Ben & Jerry's line. You do have an x-factor with that caramel core of yours though. I absolutely enjoy the caramel used in other flavors so you might have that extra something-something to keep me interested. Enough with the small talk, your meeting with my taste buds has been put off long enough. You know, Karamel Sutra, first impressions mean everything and things aren’t off to a good start. You boast about having a caramel core but it looks as if you’re all talk. There’s some rogue caramel towards the side, but other than that, all I see is a bunch of caramel ice cream with just a bit of chocolate peeking out. At least the lack of chocolate is something you have going for yourself. Eh, I called this one from the start. 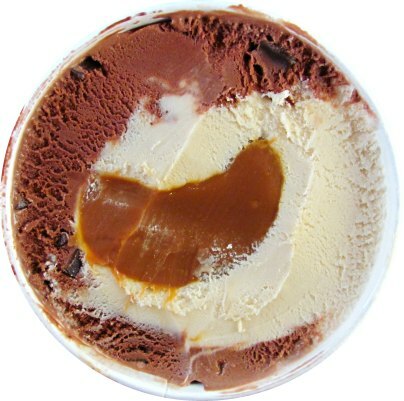 While sporting the texture and mouth feel of a super-premium ice cream, your dual bases lack any real depth of flavor. The chocolate base tastes flat and doesn't have any rich qualities to it. Thankfully there are the chocolate chunks located throughout it. While nothing spectacular, they give a fuller chocolate flavor profile. Sadly, your caramel base has no redeemable qualities. Let's be honest Karamel Sutra, your caramel base is just a glorified vanilla. There's no way anyone could identify it as being caramel flavored. Unlike the chocolate base, there’s no mix-ins to distract me from its plain qualities. I’m not saying it’s terrible; it just needs a name change. All of this can be forgiven though. Your core is what truly makes you special. While not present in the beginning, the caramel quickly comes out in full force. Simply put, it’s perfect. Sweet buttery gooey perfection, to be exact. Your core makes up for all the faults of the other components that come in your package. If you want my honest opinion, I’d say pull a Beyonce and ditch those talentless hacks. No one would ever pass you over again if you were just a solo act. Think about it kid, you know they’re just holding you back. With your 4 new siblings on their way, you don’t want to get forgotten now do you? Verdict? Ben & Jerry’s needs to make their own line of toppings. Buy Again? Just for the core. Dubba's Scoop: Just wanted to chime in and say that Nick's description of the caramel ice cream is dead on. It's got that quality B&J texture, but the flavor is crazy mild. The chocolate chips definitely help the chocolate base and I think the best spoonfuls are probably when you specifically scoop just the right combination of all four ingredients to give yourself a fairly unique taste. I agree with your opinion on the caramel ice cream, as it does not taste like caramel but more like a glorified vanilla. I had this once and did not care for it. I don't see what is so great about it. Actually, it's really boring to me and I don't know why it has not yet been buried. But then again, I usually like the types of flavors that most others dislike. Stride, I would agree it was pretty boring. Thankfully my pint was loaded with caramel so I couldn't really complain about that. I'm expecting bigger and better things form the new core flavors that should be popping up soon. It's just saddening that all of them except one use the same chocolate base and chunks. Spot on review Nick! I love caramel ice cream but this is definitely plain vanilla. The chocolate was beyond boring and the chips didn't do much for me. The core is the only redeeming quality but isn't enough to make me want to buy this one again. Sort of surprised that's it been around so long. Anon, the temptation to just de-core the pint was very strong. Everyone is all excited about this "new" core concept (saying it will change the way we look at ice cream forever, etc!) but the concept didn't seem new to me...because it's not, as you note in your post about it being introduced in 2002!!! Why all the hoopla for something that came and went and didn't last? Maybe it's like the first time they tried to roll out ebooks and it didn't really work, and the second time around it did? yeah, it all feels kind of silly. a friend just sent me the link to the excited huffpo review of the "new" products acting like some undiscovered country had been found. Ahhh, that's how you get traffic though I guess, hype it up instead of doing some research. @Scoopalicious, I'm guessing since social media wasn't a thing back then, they're trying to cash in on the hype it shoud've caused back then. I'm sure it would've been considered "xtreme" and "tothemax" back then. The "new" rollout seems ridiculous to me. Does anyone remember what the original core flavors were? Ive never had my karmelsutra look like this. Sorry you all hated it so much, this is still one of my all time favorites.